Good Morning! It's Tuesday and there's a fantastic sketch created by Debbie posted on the TMS blog ready for you to play! This week our sponsor is Digital Delights by Louby Loo - so yes, you'll see two card shares featuring Wendy's adorable images. And since it a new release, I'll be using the adorable Dolly Bunny for both. She can found by clicking on her name. Who's ready for Spring? I know I am! And we've had Spring like weather the last couple of days, it's been gorgeous... but I hear we're in for more storms and that'll make it colder again. Phooey! And just a reminder, those states that participate with Daylight Saving time - Sunday we set our clocks ahead. I'm not ready to lose that hour, we just got it back recently. Anyway, my card features Dolly Bunny, an appropriate sentiment by CC Designs and some wonderful paper that I've had in my stash for years. Please head on over to TMS to join in the fun. I love the image, and you did a good job coloring it! The purple twine is adorable too! Great job! I am looking forward to more daylight in the evenings, but hate losing the hour too! Very cute Melisa, this bunny is adorable. 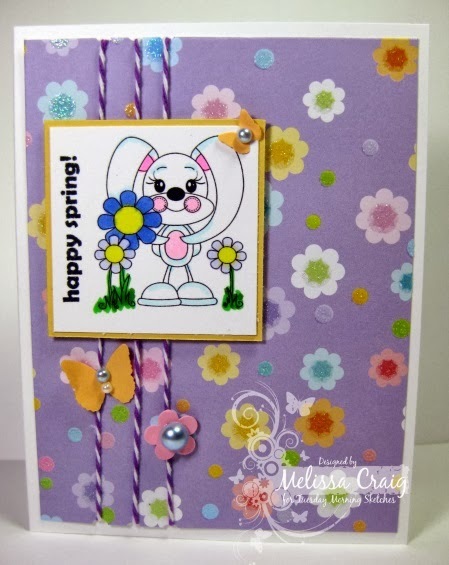 I really like this new image, Melissa..it made a really sweet card! Cute card Melissa! Love the butterfly and flower you added to the twine! This is adorable!! That image is sooo cute! !